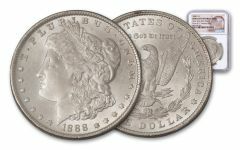 What Is a Morgan Silver Dollar? 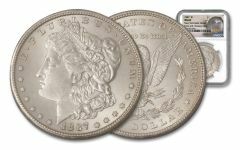 These beautiful silver dollar coins were originally minted in the U.S. between 1878 and 1904, and then enjoyed a brief revival in 1921. 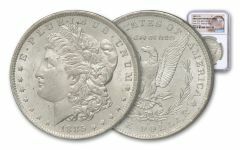 The coin was designed to replace the Seated Liberty Dollar, which stopped being minted in 1873 and was replaced by the Peace Dollar in 1921. 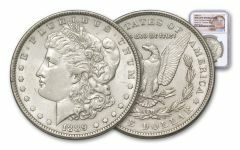 Why Is It Called the Morgan Silver Dollar? The coin is named after the person who created the design and engraved it, George T. Morgan. He was an assistant engraver at the United States Mint. What Is the Design on the Morgan Silver Dollar? The coin features two classic pieces of American iconography. The obverse (heads) side of the coin features a beautiful profile portrait of Lady Liberty, while the reverse (tails) side features an eagle with wings outstretched. What’s the History of the Coins? 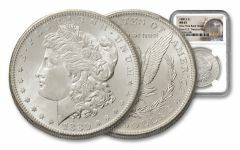 The treasury vaults made a large quantity of previously uncirculated Morgan Silver Dollar coins available in the 1960s. This included several issues that were once believed to be nearly unobtainable. The treasury also sold additional silver dollar coins in the 1970s. 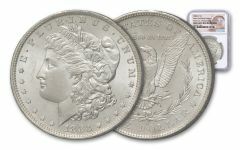 Today, GovMint.com is proud to offer fine examples of both circulated and uncirculated Morgan Silver Dollars. How Were the Coins Designed? 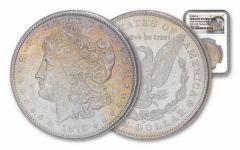 Henry Linderman, the director of the U.S. Mint from 1866 to 1869 led the efforts to redesign coinage in the U.S. His search led him to London, where he sent a request to the deputy master of the Royal Mint, requesting a “first-class die-sinker.” They responded and recommended George T. Morgan as there wasn’t much work available in the United Kingdom at that time. 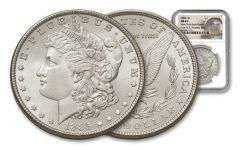 George T. Morgan would start work at the Philadelphia Mint on a six-month trial period. Morgan knew that he wanted to design a new portrait for Liberty, and became a student at the Pennsylvania Academy of the Fine Arts. The model for Liberty was an American lady, Anna Willess Williams. 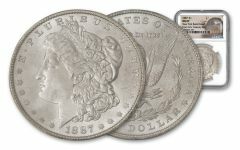 While at the academy, Morgan also made several studies of the bald eagle which he would later incorporate into the dollar silver coin. When Was the Coinage First Minted? They started minting the Morgan Silver Dollar coins on March 11 1878, at exactly 3:17 p.m.
What Is the Size, Weight, & Composition of the Morgan Silver Dollar Coin? 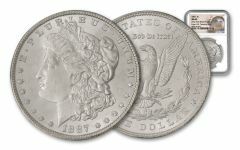 The coin contains nearly 90 percent silver, with the remaining 10 percent being copper. It measures one and a half inches in diameter and weighs 0.94 ounces. Where Does the Silver in the Coins Come From? All Morgan Silver Dollar coins were minted from silver obtained from the Comstock Silver Lode. It’s located under the eastern slope of Mount Davidson in Nevada and was the first major discovery of silver ore in the U.S. The lode was mined between 1859 and the 1920s. 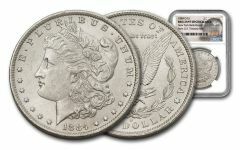 What Issues of the Coins Does GovMint.com Carry? We’re delighted to offer you hundreds of different issues and dates for the Morgan Silver Dollar. 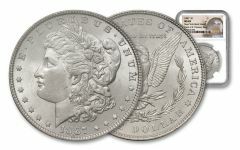 We currently have over 200 different types of Morgan Silver Dollar (both circulated and uncirculated), ready for purchase today. At GovMint.com, we’re dedicated to providing you with exceptional, personalized help. We want to make sure you get exactly the item you want, and that you’re delighted with your purchase. Call a coin professional at 800-642-9160 today.